Just because night has fallen doesn't mean work is done. 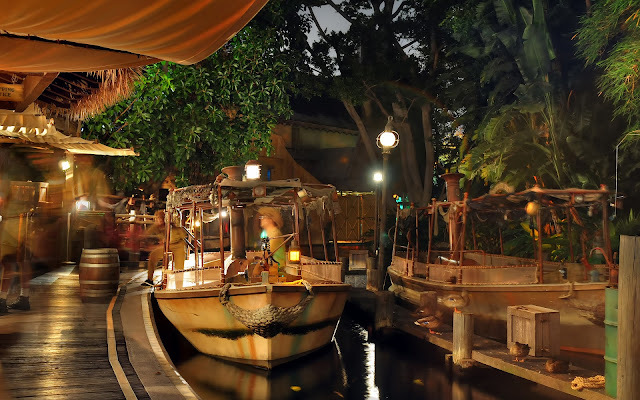 At the World Famous Jungle Cruise, there are still tours to deliver and people to load. Those hot shot skippers aren't going to let the jungle stand as a barrier just because of a little thing like darkness. No, no, no, there are more guests to take out--half way for half price--and more bad jokes and groan-worthy puns to deliver. Besides, night is when the animals are most active. So why not take a tour in the evening? You might find the adventure most englightening! Loading and unloding at the Wold Famous Jungle Cruise.